Yemen Has Become A Living Hell For Children, UNICEF Official Says In addition to causing shortages of food and clean water, fighting has led to the breakdown of Yemen's medical system. Half of Yemeni children under 5 are chronically malnourished, the U.N. reports. 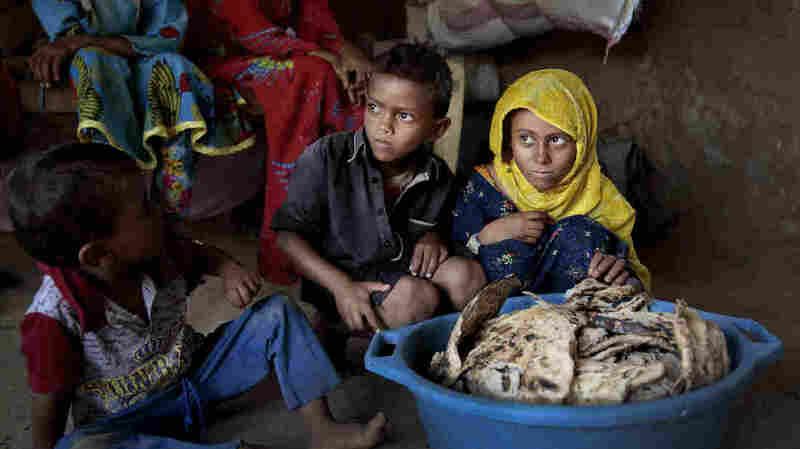 Children sit in front of a tub of moldy bread in their shelter in Aslam, Hajjah, Yemen, last month. The U.N. has estimated that up to 14 million Yemenis — about half the country's population — will suffer severe food shortages in the next few months. The humanitarian situation in Yemen is worsening, with millions of children at risk of starvation and fighting intensifying despite international pressure for a cease-fire in the country's civil war, according to a senior United Nations official who last week visited the rebel-held port of Hodeidah. Geert Cappelaere, the regional director for UNICEF, says Yemen is a "living hell" for children. In addition to creating shortages of food and clean water, fighting has caused the breakdown of Yemen's medical system, including immunizations, leading to fatal outbreaks of measles and diphtheria. "The reason is the economic crisis, the devaluation of the rial and the fact that most commodities are not any more affordable for the most vulnerable people," Cappelaere told NPR on Sunday in Amman, Jordan. The U.N. has estimated that up to 14 million Yemenis — roughly half the country's population — will suffer severe food shortages in the next few months. The United Nations International Children's Emergency Fund plans to increase assistance in Yemen, including emergency cash payments to the most vulnerable families, Cappelaere said. Starting in December, it expects to provide monthly payments to 131,000 teachers who have not been paid for two years. According to the U.N., half of Yemeni children under 5 are chronically malnourished. It says 400,000 children are so malnourished that they will likely die without intervention. Cappelaere, formerly based in Yemen, told NPR that vaccination levels had dropped to 55 percent of the child population, down from 70 percent before the war. He said the front lines of fighting in Hodeidah last week were less than a mile away from Yemen's largest hospital. Despite recent pressure from the U.S. for a cease-fire, fighting for the Red Sea port city has intensified as Sunni Gulf Arab forces backing Yemen's exiled government battle Iranian-backed Houthi rebels. The Saudi-led coalition launched more airstrikes over the weekend in a bid to take control of Hodeidah. The war in Yemen has raged since 2015, when Houthis occupied northern Yemen and Saudi Arabia assembled a coalition to try to dislodge them. The United States sells weapons and provides logistical support to the Saudi-led coalition. Last week, U.S. Secretary of State Mike Pompeo and Secretary of Defense Jim Mattis called for a halt to the fighting. The U.N. Security Council is expected to meet this month to discuss the Yemen conflict. At a news conference in Amman earlier on Sunday, a visibly angry Cappelaere laid the blame for the humanitarian disaster on countries supporting the warring parties and not just those fighting. "Every single country that has influence over the fighting parties in Yemen is responsible for the suffering of Yemeni children," he said, while declining to name those countries "It's not just those who actively fighting in Yemen." To bypass a Saudi-led blockade that has prevented large shipments of food and fuel from entering Hodeidah's port, Cappelaere said UNICEF was exploring options such as looking into Oman as an alternative entry point for aid. He said UNICEF has been bringing in medical and other supplies on much smaller boats from countries including Djibouti. But then, Cappelaere said, UNICEF faced weeks-long delays in getting medicines cleared to leave the port. He said they also faced difficulties importing vaccines by plane. "Vaccines have no political, no military interest – we are just there to vaccinate children," Cappelaere said he told Yemeni officials. "The sheer amount of time and energy we are putting for having flights cleared in having vaccines into the airport. And then the struggle we are having then to get the vaccines out to each and every individual child is a nightmare." He said UNICEF also faced severe problems in obtaining visas for aid workers. The U.N. estimates that at least 10,000 people have been killed since the war began. Many researchers believe the real toll is significantly higher. The U.N. figure does not include deaths from malnutrition or diseases such as cholera which have ravaged parts of Yemen, which even before the war was one of the world's poorest countries.